Lisduff (O.S. 65.) 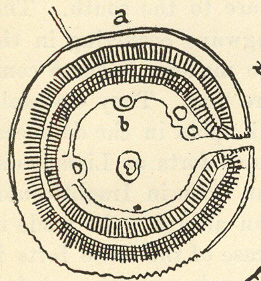 This fort is conspicuous from its situation on a shoulder of Moveen West and its high ring, both from the main road to Carrigaholt and Cross, and from that over the bridge at the pretty creek of Bealanaglas. It is very perfect and nearly circular, being 105 feet to 108 feet across the garth, 190 feet over the ring, and 223 feet over all. The fosse is cut into the rock for 4 feet to 6 feet deep, and varies in width from 17 feet at the north to 18 feet at the gangway (east), and 10 feet to the south. The mound is largely of stone, rising 17 feet or 18 feet over the fosse and 8 feet 6 inches over the garth, being 1 foot or so lower to the south. It had a low terrace 3 feet to 5 feet wide round the inside of the bank; but this is much cut up by pits made (I hear) for the most part by a local treasure-seeker named Green; one was evidently dug shortly before our last visit; no antiquities were found. One point of importance in the cutting of the fosse is that a gangway is left in the rock, which shows that in certain cases this feature was coeval with the fort.